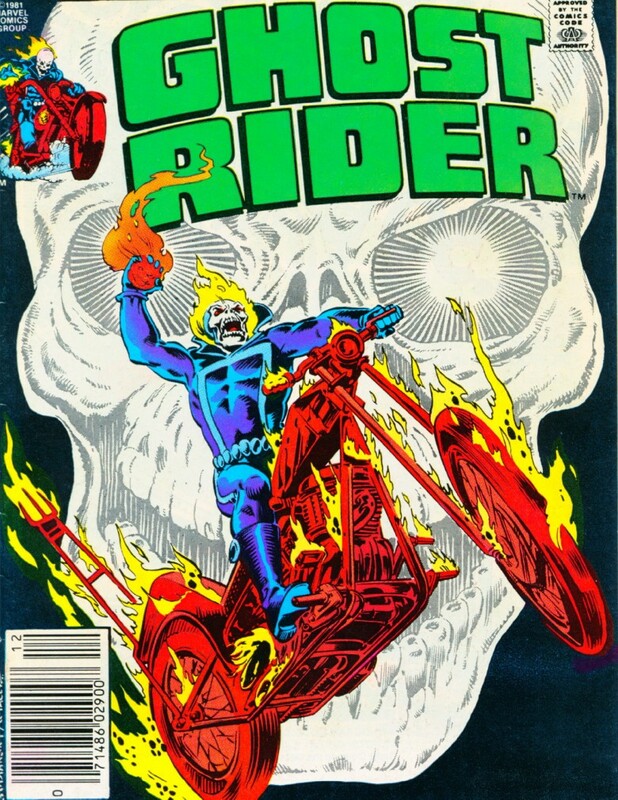 I was going to title this post “Last Ride,” but I wouldn’t want to rule out another Ghost Rider post in the future—not even after the exhaustive coverage in both Back Issue #95 and here on the blog. As mentioned previously, the gist of the BI article was to focus on what made the Bronze Age Ghost Rider great, leaving the leftovers I’ve been spooning out here largely negative as a result. So I want to return to GR one more time to bring the focus back to the positive, as well as pass along a few nuggets of info that, for one reason or another, were left out of the article. So… to review: In the beginning, GR was a Marvel horror character, fitting in rather neatly alongside Werewolf by Night, Frankenstein, and Tomb of Dracula. While they didn’t make use of the “inner demon” allegory at all and there were continuity headaches aplenty, the artwork by Ploog & Sutton was great and the action was fun. With the departure of writer Gary Friedrich, new regular writer Tony Isabella would take the book in a more conventional superhero direction. This represented something of a trade off, in my mind, as I feel the character/strip works better as horror; but on the other hand, Isabella’s run didn’t have the rash of gaffes and errors that plagued Friedrich’s stint at the end. I should clarify here that just because I think the horror approach works better for Ghost Rider, that doesn’t mean I find the superhero approach to be bad, necessarily. I think the Ghost Rider character has a lot of versatility and can still do well as a superhero—commercially, certainly, if not artistically. Marvel’s Werewolf book provides good juxtaposition here. Near the end of the original Werewolf by Night strip, they tried to save the book by turning the werewolf into a superhero and the effort failed rather miserably. Ghost Rider, however, seemed to sell regardless of the approach, be it superhero or horror. Anyhoo, after Isabella, we have this brief period of Conway & Shooter. And though it was brief it was important, because it was during this time that the strip finally began to lean into the “inner demon” allegory. Roger McKenzie would follow, picking up the torch for a year (seven issues) before passing it along to Michael Fleisher, who would write GR for nearly three years—a total of thirty-one issues straight. The strip ended at its creative zenith with Roger Stern and J.M. DeMatteis writing the final fifteen issues. My biggest regret with the article was that I couldn’t talk to Fleisher. Firstly because he had the longest run on the strip of any writer, so some words from him were certainly warranted; and secondly because several of his creative choices would have consequences through the end of the book. Made sense to me too. Really, there aren’t many other famous clowns in the Marvel Universe that he could have been. There are only two other possibilities that could be considered remotely feasible. One would be the “killer clown” from Spider-Woman #22 (Jan. 1980)—and the only reason I would even consider this plausible is because Fleisher wrote the story in question. The other possibility is that Corky’s son was meant to be a new, original character that would be introduced to the Marvel Universe by the storyline. Of course, only Fleisher knows what his original intentions may have been. Again, I regret that I didn’t get the chance to ask him about it. That was just us being silly. I should explain that Michael Fleisher never used a nickname, and he was always credited as “Michael” in his work. Which, of course, is as it should be. But someone—I forget who—pointed out that this made everyone else’s credit read as somewhat less than formal. So, for that one issue, we decided to list everyone’s name more formally. For example, our letterer Clem Robins became “Clement Robins” … and colorist Ben Sean became “Benedict Sean.” In retrospect I probably should have included everyone’s middle initials as well. If you’re interested in the peak era of the Bronze Age Ghost Rider and don’t mind hunting down a few extra back issues, Ghost Rider #63 might be the ideal place to start, as it introduces the supporting cast that will remain through the end of the title. Plus the cover art (above) is pretty sweet. So even though the Stern-DeMatteis run was the height of the strip, for the first-time readers out there looking to give these stories a try, I might suggest starting with Ghost Rider #63 (Dec. 1981). Not only does Fleisher introduce the Quentin Carnival in this issue, it also has GR’s final encounter with his longtime archfoe the Orb, featuring great art by Luke McDonnell and Sal Trapani, all behind a stunning cover by Bob Budiansky. The closing Stern-DeMatteis tenure on Ghost Rider actually begins with issue #67 (April 1981), in what was originally meant to be a fill-in. It proved to be a rather compelling ghost story. conflict. Besides, the Satan that was portrayed in the pages of GR was always the fantasy Satan of literature, not the Bible, so there were never any real religious implications with the portrayal. Or at least none that I could see. One of the plot developments that seemed inevitable to me was the Ghost Rider hurting an innocent person. When Stern finally had it happen to Eliot (the eponymous Clown), I wondered how long it had been planned. When I asked, Stern responded: “I’m not certain, but that probably came to me during the plotting stage. Of course, I don’t know that I’d call The Clown ‘innocent.’ He was, after all, guilty of a good many crimes. I’m not sure that a truly innocent person would have that much to fear from the Ghost Rider.” I was a bit taken aback by this, because in the context of the story it’s clear that GR has made a terrible, tragic mistake in his attack on Eliot. When the character of Centurious first appeared (GR #74, Nov. 1982), I’m fairly sure that it wasn’t the intention of the creative team that he would have the elaborate history with Zarathos/the Ghost Rider that would be revealed later. (I would guess this came about as a result of the book being cancelled and, with that, the natural desire to tie up every loose end.) Unfortunately, neither DeMatteis and nor Budiansky (who was co-plotting at that point) could recall if this was the case, or what their original plans may have been for Centurious if it was. For some reason I just always think of issue #75 (Dec. 1982) as a double-sized anniversary issue, even though it’s not. The appearance of Steel Wind taking up most of the cover just feels like an “event” somehow, like we’re being introduced to a major character. Plus there’s so much going on in this great issue it just feels absolutely stuffed. In any case, it’s a great story—probably worthy of a separate review of it’s own one of these days. While DeMatteis said they were given plenty of notice regarding the cancellation of the series, he could not recall precisely when he knew the end was nigh. But if I had to guess, I’d say that from issue #77 (Feb. 1983) on, the stories were written with the knowledge that the series was going to culminate with the 81st issue (June 1983). At various times, Cynthia Randolph seemed to be a potential love interest for Johnny Blaze (most probably during the end of Fleisher’s stewardship). I asked if there were ever any plans for her along these lines, but alas, once again no one could remember. For anyone out there who missed it the first go-round, I can’t urge you strongly enough to search out some back issues. 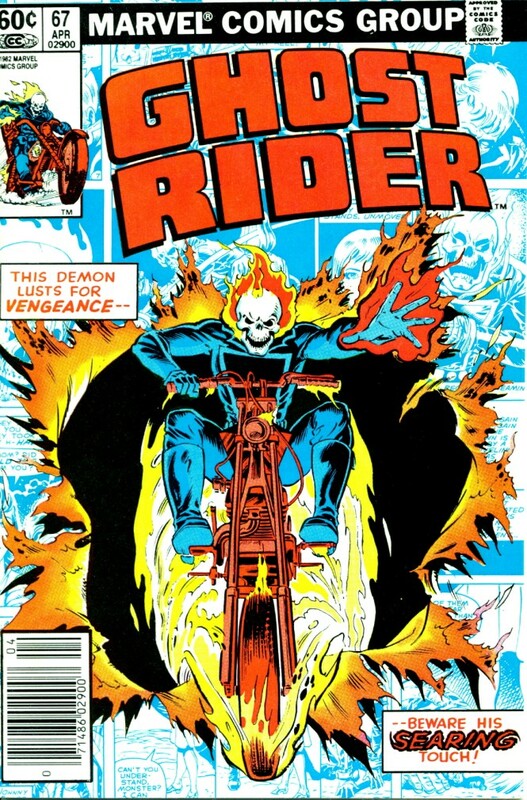 The height of the series (issues 68-81) was reprinted in 1991 in The Original Ghost Rider Rides Again series, which can be found online relatively cheap. Most of the issues immediately prior are fairly inexpensive as well.